A picturesque yet literal reference to several Pueblo cultures, such as the Hopi and Zuni, who have many ceremonies surrounding rain and water. Although originally semi-nomadic, Puebloan culture altered over time into settled communities that cultivated fields of subsistence crops. Rain, therefore, held an especially important place in the traditions. Pueblo approaches to agriculture often include an idea of reciprocity in which the people feed spirits and pay reverence to the elements, and, in turn, they are given the rains necessary for growing staples such as corn, beans, and squash. 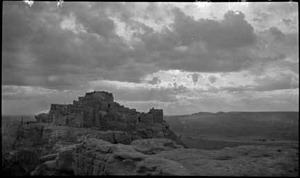 "Clouds over Walpi Pueblo, Hopi, Arizona, circa 1915," Kenneth Chapman Collection, Palace of the Governors Photo Archvies, New Mexico History Museum (021594). 2000 Hopi Ceremonialism. Encyclopedia of Native American Religions, Updated Edition. New York: Facts On File, Inc.
York: Facts On File, Inc. Edition. New York: Facts On File, Inc.